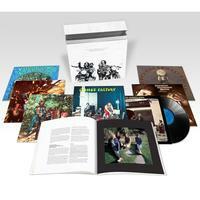 180-gram 7LP Deluxe Box Set celebrating CCR's 50th Anniversary! The arrival of Creedence Clearwater Revival's 50th anniversary brings an unprecedented celebration of everything the band contributed in their short but startlingly epochal time together (1968 - 1972). To commemorate this milestone, Craft Recordings is releasing a lift top box set with seven LPs, each housed in replica first-pressing packaging with an 80-page book featuring new liner notes, historic photos and band ephemera. 180-gram vinyl cut at half-speed.